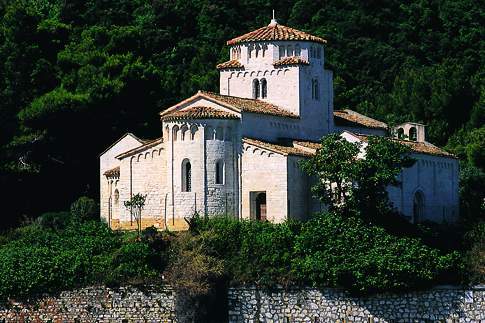 The Marche is dotted with about a hundred abbeys, often within walking distance of each other. In the section Things to see you can find the most important abbeys open to the public and telling of the proud Middle Ages of this region. The visit of an abbey represents a unique moment of knowledge and meditation: among the many firsts set by The Marche, is that of having been one of the first geographical areas in the Italian peninsula to have accepted the phenomenon of Monasticism, a spiritual movement born in the East in the III Century AD and spread in the West as early as the VI Century, thanks to the charismatic personality of St. Benedict of Nursia, whose “Rules” represent the Monasticism’s first written constitution and are based on the dignity of work and the sanctity of prayer. They so gave rise to a new way of life that was to enjoy enormous popularity in Europe and was to become one of the pillars of the formation of Western civilization. Thanks to the easily travelled valley routes, between the Foglia and the Tronto rivers, as early as the VII and VIII Centuries, monasteries and convents began springing up in the Marche, often at a short distance from one another, along the paths travelled by the first pilgrims heading for Rome, called “romei”.